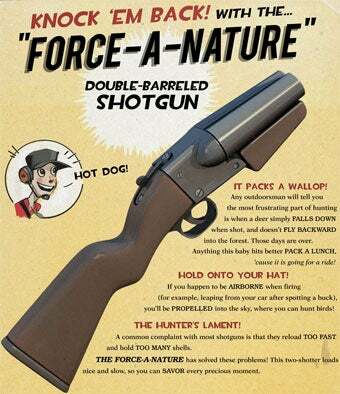 Final Team Fortress 2 Scout Update Is A "Force-A-Nature"
Valve has revealed the final unlockable for Team Fortress 2's lovable Scout, a double-barreled shotgun called the "Force-A-Nature." Also interesting is the order in which the class' three new weapons will be unlocked. Valve is leaving that up to you, letting the Team Fortress 2 voting public decide which comes first: the Force-A-Nature, the Bonk Energy Drink, or the Sandman. We suppose that, prior to voting, you should know what the Force-A-Nature does. The unlockable shotgun not only knocks back whoever is on the receiving end of a Force-A-Nature shell, it can give the Scout some serious kickback too. Does that mean rocket... err shotgun jumps? Valve has a third update on tap — a new t-shirt that's also Scout themed. It's on par with Valve's other soft torso goods and not nearly as desirable as their games. No offense, guys, but we think there's some room for improvement here.